Apply Combo to self, allies at target, directly adjacent. + +8~16 CP to self, allies at target, directly adjacent. I'm Tetsuox. From here on out, you are the boss. First things first, let's get rid of them. Haah, finally I can be of use to the boss. No time to waste, I'll destroy them all! Prepare yourself for the 4 surrounding tigers. Killing Sky! Great, great, great, great black whirlwind! Heheh, a crushing defeat. So, how did I do, boss? Chapter 7 Opening Ceremony (6/1/18 ~ ? ): Hey hey, don't leave me behind. Even if it's dangerous, I'll stay by your side, boss. Glad you could make it, boss. If you're done with work at school, then you must be tired. It must've been hard for you. The Shinjuku Kabukicho guild where the strays gather, Outlaws. 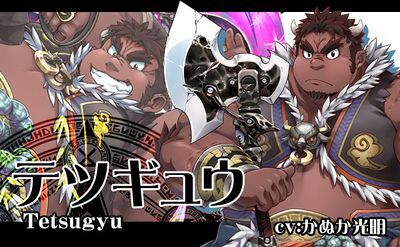 Tetsuox is the Transient self proclaimed head of the shock troops whose herculean strength is acknowledged by all around him. 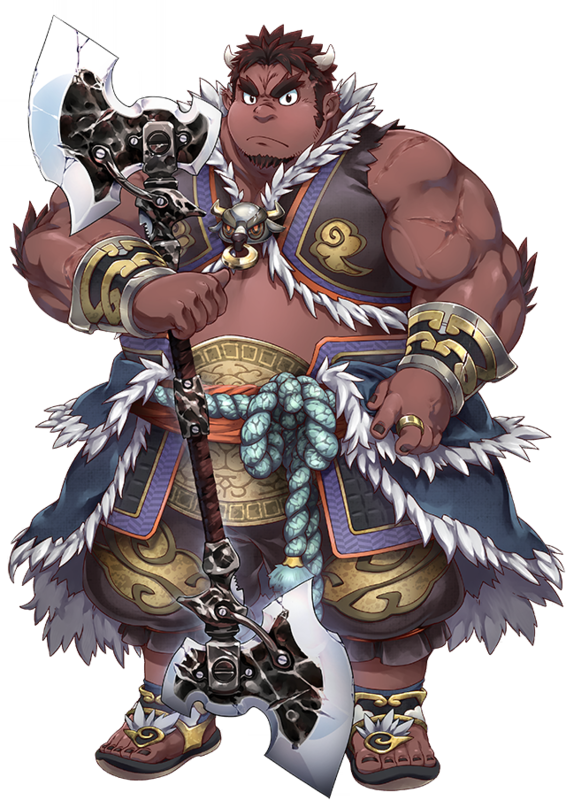 However, he also is self-admittedly not the type to use his head much, so he tends to entrust big decisions and just about everything else beneath that to the master he accepts. That would be one thing, but he has a peculiar opinion of life and death. What makes him happy about battlefields is because that is where he can die along with the superior he respects. So if anyone summons him and ends up garnering his respect, their relationship after will certainly be filled with many hardships. Battles between groups is where his best strengths lie, and if he had a trophy to swing around he raise the spirits of his allies and blow away his enemies like scrap paper. That continuous attack is like a black whirlwind, drawing in anything and everything as it gets bigger. It will grow without limit until his life burns away. With his large frame and great strength, he is horrible at handling weak children. He carries heavy mental scars because of how his mother died if facing a situation where someone were to be devoured by tigers. Really cute and an awesome character and outfit design to boot. He's practically designed to be the perfect point man for a team because of that skill. What does "When leaving" meaning? does it proc when Tetsu is killed? Or at the end of a phase? So wait, is he in the normal gatcha too ? I'm so happy because the event is near its end and i was afraid not to get him, but I hopefully got him in time ! I'd fight him. Then cuddle him. Secretly, he works as a yoga teacher to fund the guild operations. How else can he stretch his lag that far? Name derives from 哲夫 -> tetsuo (iron man) and ox (fat cow). This page was last edited on 29 December 2018, at 15:18.